ANZ Rewards credit card customers can score up to 10 bonus ANZ reward points per dollar spent on everything from flight and hotel bookings through to online shopping for fashion, homewares, technology, liquor and more, simply by starting their shopping journey through the ANZ Rewards Bonus Points Mall. Whether it's jewellery from Tiffany & Co., a business class ticket with Etihad or Qatar Airways; a hotel booking through Agoda, Booking.com, Hotels.com or Wotif; some new kit from Apple, Dell, HP, Microsoft or Samsung or even food to your door via Menulog, there are plenty of ways to clean up on bonus points. Similar to the Qantas Points Online Mall and Virgin Australia’s Velocity eStore, shoppers earn their bonus points by visiting the ANZ Rewards website, clicking through to a participating retailer and completing their purchase in that same session. But rather than earning frequent flyer points direct to your airline account, these are awarded as bonus ANZ Rewards credit card points, which you can later manually convert into points with Virgin Australia, Cathay Pacific, Singapore Airlines and Air New Zealand. That means you’ll need an ANZ Rewards credit card to participate, such as the ANZ Rewards Black, ANZ Rewards Platinum, ANZ Rewards Travel Adventures or ANZ Rewards Classic cards, with points from the Bonus Points Mall awarded in addition to what you’d ordinarily earn by spending on your card. For example, spending on the ANZ Rewards Black Visa normally provides 2 ANZ reward points per $1 spent up to $5,000/month, or 1 ANZ reward point per $1 spent thereafter. Use that Black card to shop via the ANZ Rewards Bonus Points Mall and you can earn both the card's base rate of points, and the points offered by the Bonus Points Mall, to double dip. Shop with a business offering 10 bonus reward points per $1 spent, for example, and you could ultimately be earning up to 12 ANZ reward points per dollar charged to your ANZ Rewards Black card: that's up to six Virgin Australia Velocity points per dollar spent when points are converted at a 2:1 rate! ANZ credit cards attached to the Qantas Frequent Flyer program aren’t eligible to earn these ANZ bonus points, as these cards aren't attached to the ANZ Rewards scheme through which these extra points are offered: instead, delivering Qantas Points into your Qantas Frequent Flyer account every month. 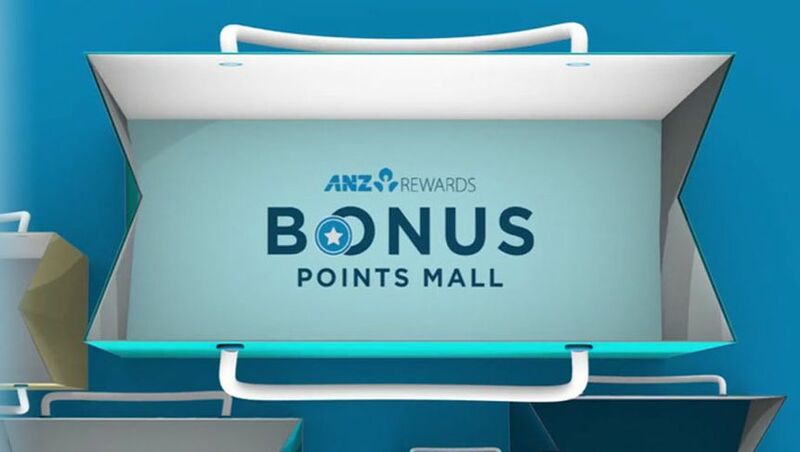 ANZ Rewards Bonus Points Mall: how many points can you earn? Remember, these bonus points are on top of any ANZ Rewards points you’d normally earn via your credit card. To earn bonus points, you’ll need to remember to click through the ANZ Rewards Bonus Points Mall website each and every time you shop or make an online booking – forget that critical step and you’ll earn no bonus points on that transaction: only the standard number of points your ANZ Rewards credit card would earn just like on any other eligible purchase. Also know that many of the retailers participating in the ANZ Rewards Bonus Points Mall are also partnered with the Qantas Points Online Mall and/or the Velocity eStore, and the number of points (or value of the points) you can earn per dollar spent may differ between them. For example, shop with Apple iTunes via the Velocity eStore and you’d collect two bonus Velocity points per dollar, while making the same transaction via the Qantas Points Online Mall attracts a higher three Qantas Points per dollar. Shop instead via the ANZ Rewards Bonus Points Mall and you’d scoop up 10 ANZ Rewards points per dollar spent: equal to five Virgin Australia Velocity points, or 3.33 Cathay Pacific Asia Miles or Singapore Airlines KrisFlyer miles, trumping both airline stores. The opposite can also be true, such as with Microsoft. Shop via the ANZ Rewards Bonus Points Mall and you’d earn three bonus ANZ reward points per dollar spent (equal to 1.5 Velocity points or one Asia Mile/KrisFlyer mile), while shopping via both the Qantas Points Online Mall and the Velocity eStore attracts a higher two frequent flyer points per dollar spent. To maximise your points, it's good practice to check how many points you could earn via each of the online malls at your disposal before making a purchase – choosing the mall that delivers the highest number of frequent flyer points per dollar spent will make each shop as rewarding as it can be. ANZ Rewards Bonus Points Mall: don’t have an ANZ Rewards credit card? ANZ Rewards Black Visa: Earn 2 ANZ reward points per $1 spent on eligible purchases up to $5,000/month (1/$1 thereafter), with an offer of 120,000 bonus ANZ reward points + $100 back on your card statement for eligible new customers who apply and spend $7,500 on eligible purchases in the first three months. A $375 annual fee applies. ANZ Rewards Platinum Visa: Fetch 1.5 ANZ reward points per $1 spent on eligible purchases up to $2,000/month (0.5/$1 thereafter), plus 75,000 bonus ANZ reward points for eligible new customers who apply and spend $5,000 on eligible purchases in the first three months, and pay an affordable $95 annual fee. ANZ Rewards Travel Adventures Visa: Earn points at the same everyday rate as the Rewards Platinum Visa, but with 40,000 bonus Virgin Australia Velocity points when you spend $500 on eligible purchases in the first three months of card approval. There's a $225 annual fee, but the card includes a free return Virgin Australia domestic flight every year, two Virgin Australia lounge passes and has no international transaction fees when making payments overseas. Already an ANZ Rewards credit card customer? Then start shopping now to begin earning bonus points!